It is a honor to share with you Stéphane Dufour exceptional artistic talent. Take some time to see all his art here and much more on his website with Information & details. 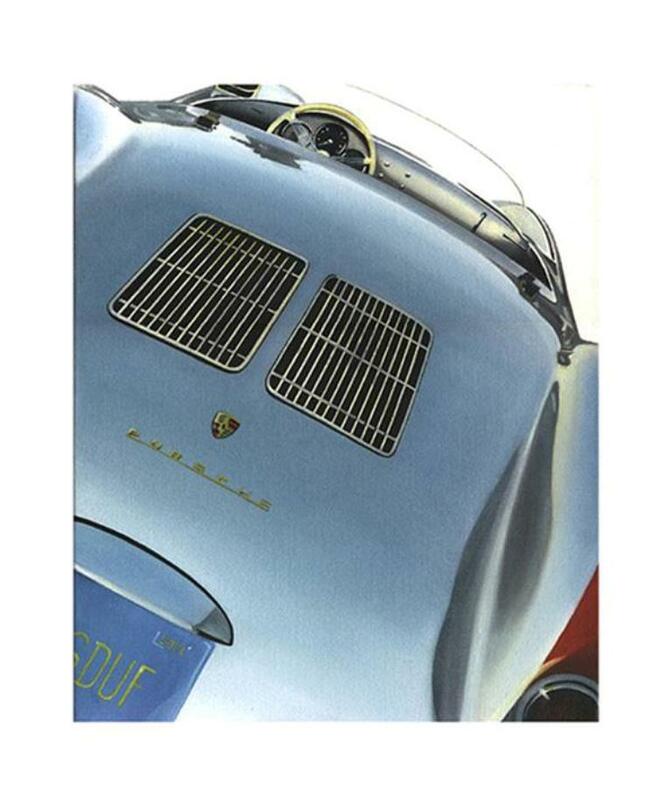 Stéphane Dufour, international automotive artist, decidedly contemporary, displays an exceptional talent for emphasize light, forms and sensuality of the most iconic sports cars. 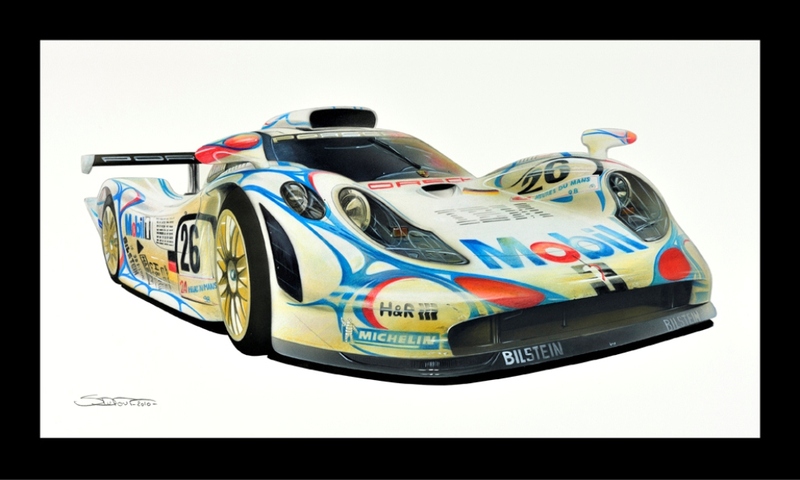 The Porsche 911, in its GT1, GT2, GT3, RS, Turbo and Speedster version, sits side to side with the epic 24h du Mans 917, 550 Spyder and 959 supercars or Carrera GT in original and limited edition art work. 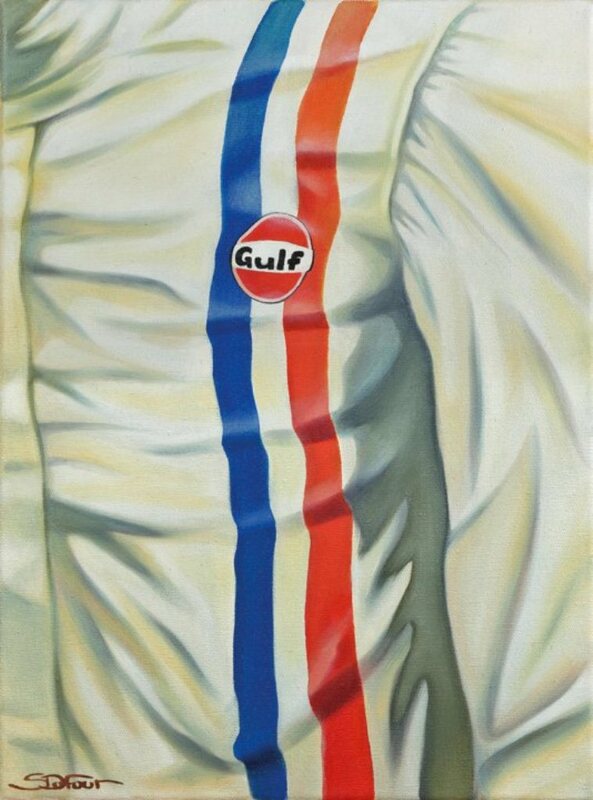 His hyper realistic paintings devoted to Ferrari, Lamborghini, Maserati, Aston Martin, Alfa Romeo, Chevrolet Corvette, Citroen, Jaguar, Shelby, Ford, Harley-Davidson or Michael Schumacher complete his master piece dedicated to prestigious, competition and collection automobiles. Stéphane DUFOUR was born in Bellac, France, in 1970. He spent most of his childhood contemplating fine automobile craftsmanship passing through his father’s workshop. 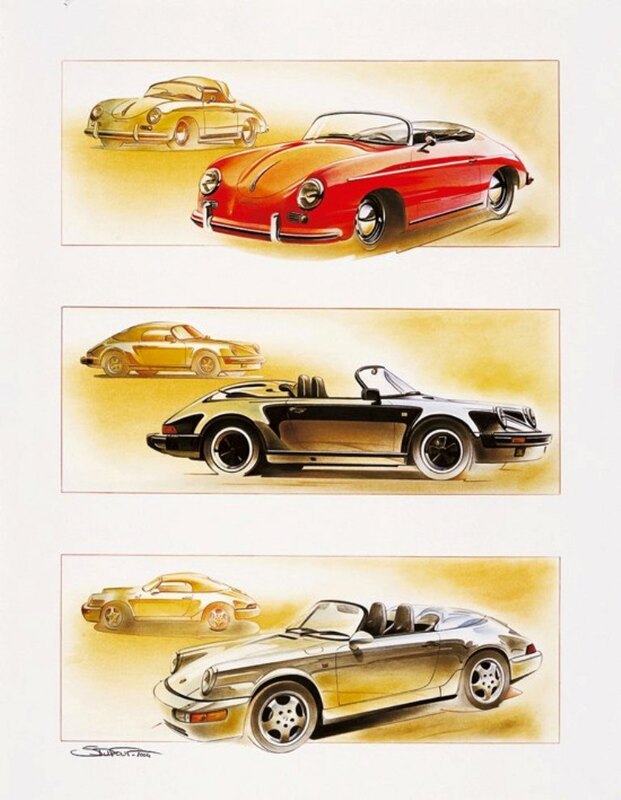 His father repaired and serviced prestigious cars, authentic masterpieces which stimulated Stéphane’s imagination and would deeply influence this young boy’s day to day life. Original done in colored pencils. 1/150. 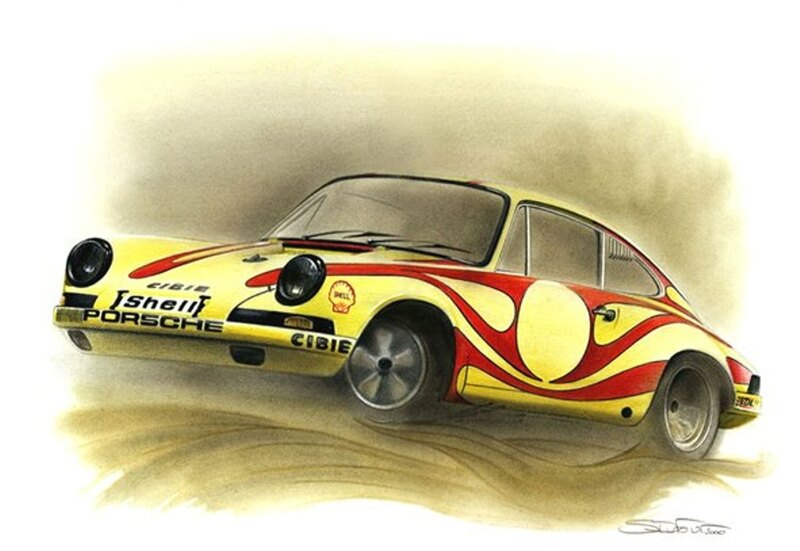 While attending his first lessons at the Art Decos school of Limoges, he realized he could combine his passions for drawing and beautiful cars. Stéphane was unquestionably inspired by the 50s, 60s and 70s automobiles. Three decades unanimously considered as the pinnacle of car design and conception by all car amateurs. 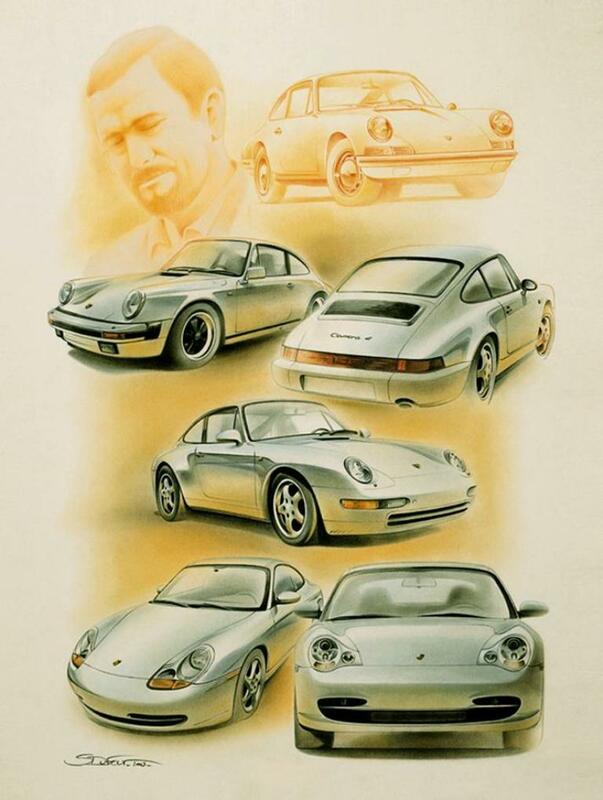 With a simple pencil or charcoal he started drawing, with great talent, these legendary cars which were all hauting his mind. At the time his preference for “3/4 front” and black and white drawings is evident. After studying three years at the Art Décos school, he established his unique and innovative style, synthetising space, light, shape, movement and color. original was done in oil. 1/300. 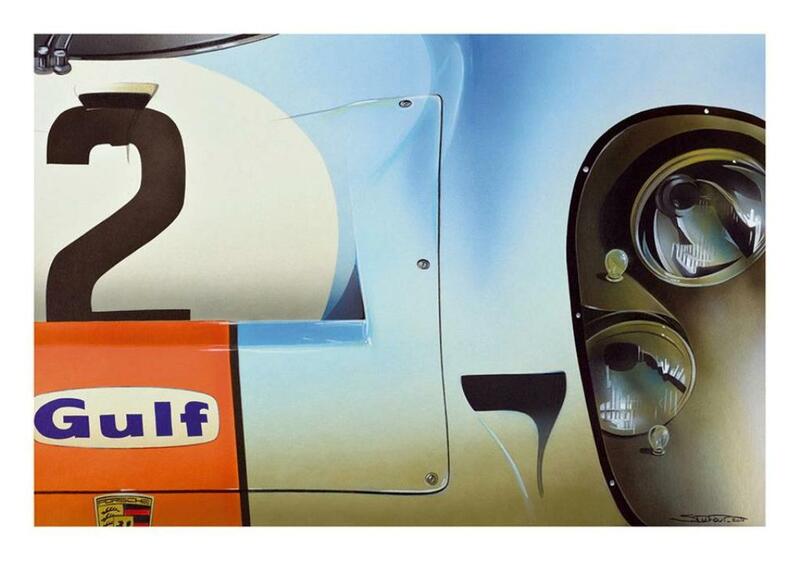 Pushing his work on reflections and details to the limit, his paintings now emphasized the light and shadows rapping around exquisite bodywork. 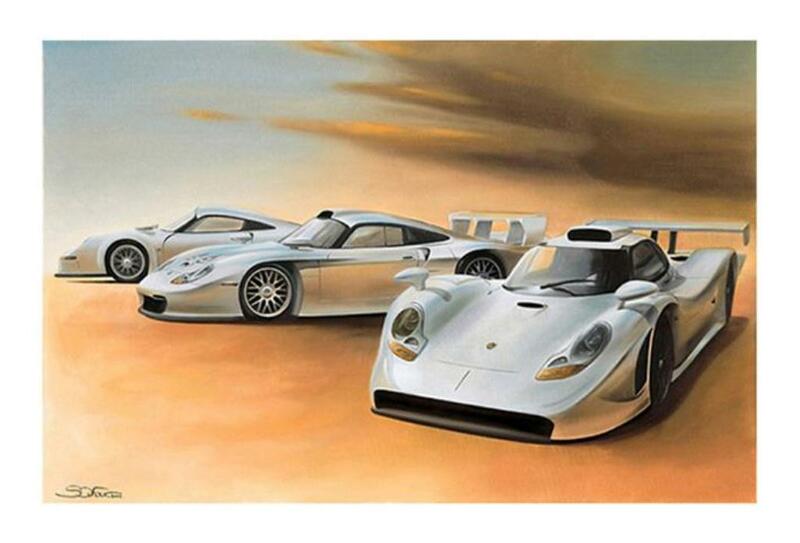 Stéphane’s work is eclectic, ranging from Ferrari to Aston Martin and passed Citroen. 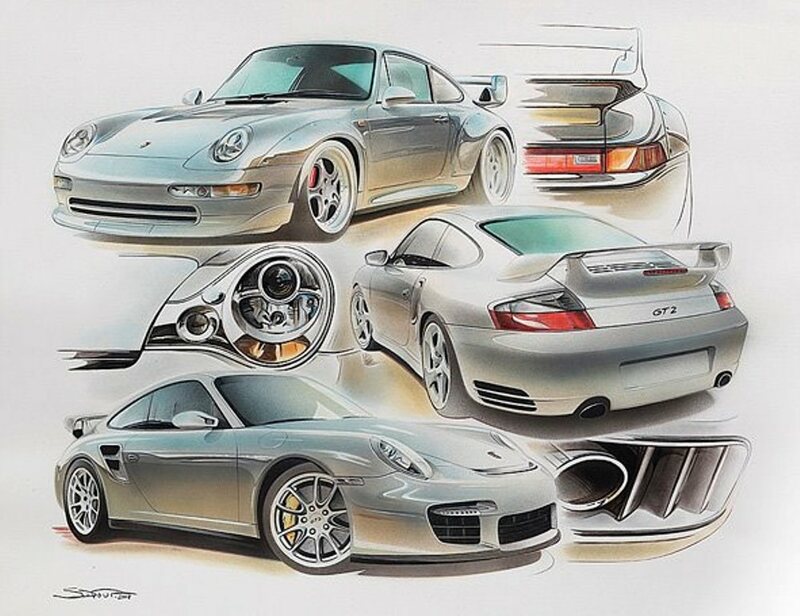 However his unassailable passion for Porsche shines through with numerous and honorable art works of unique German supercars. 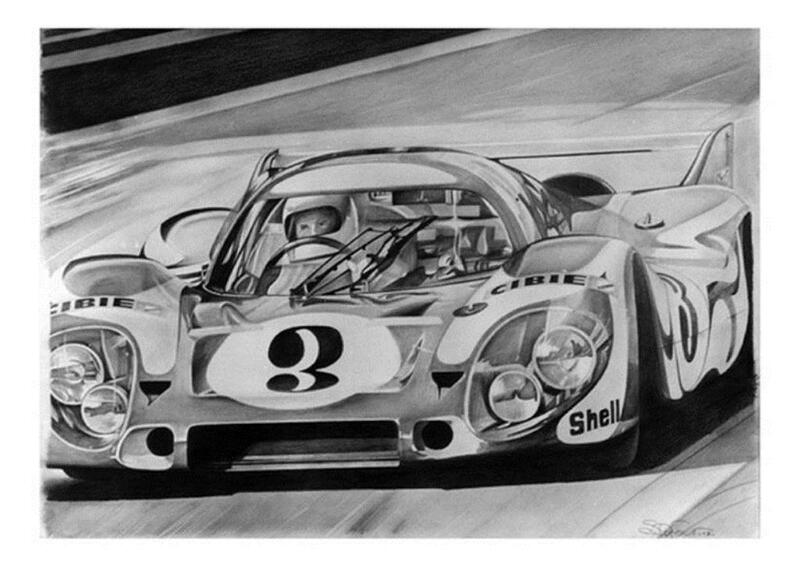 These paintings and drawings of epic Porsches, Le Mans prototypes and exceptional 911s, guaranty him an international acclaim. 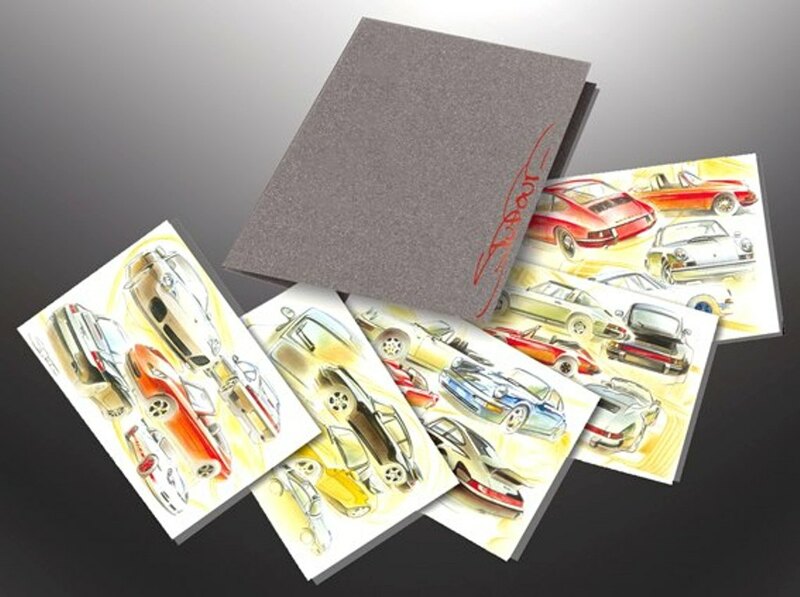 Moreover the quality of his work was officially recognized by the Porsche firm, who have guaranteed him over the past years a certified international licence for artistic reproductions of the Zuffenhausen‘s production. 1/200. original was done in colored pencils. With over 200 canvases in experience, Stéphane Dufour is now adamant in using new technologies to help develop his artwork. After years using only pencils, oil paint or airbrush, Stéphane started sculpting in 2004 and recently using digital technology, thereby enriching his artistic production. He describes his own work as hyperréalistic, but also claims a more abstract style on certain paintings, sculptures and digital artwork principally. 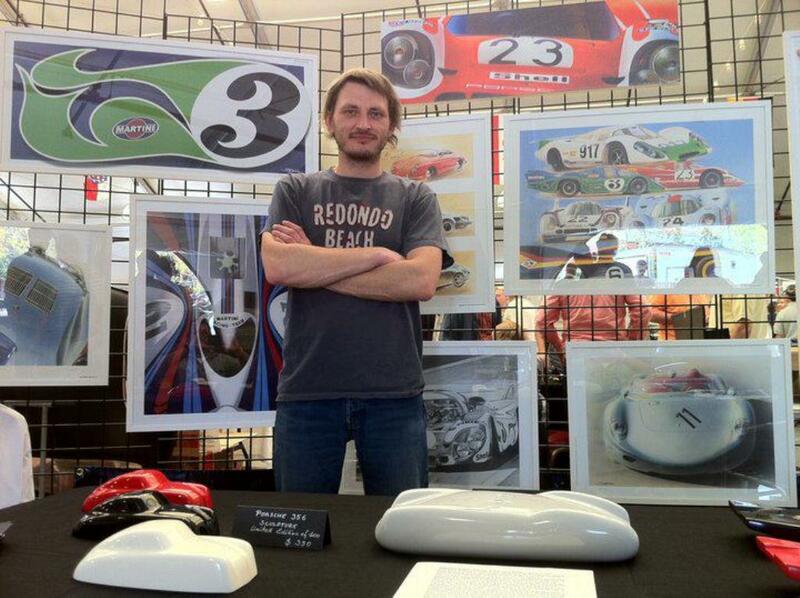 All of Stéphane’s work are unique limited editions as well as signed and marked by him. Stéphane also works on private command by individuals or companies, where he is systematically asked to let his imperishable imagination guide his inspiration towards a specific model. 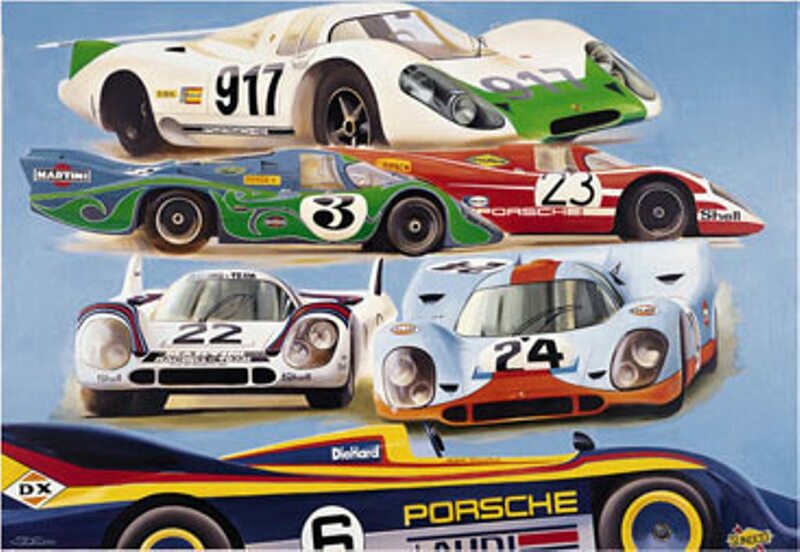 An authentic source of joy for anyone who understands that art and automobiles are two intertwining and intimate domains. 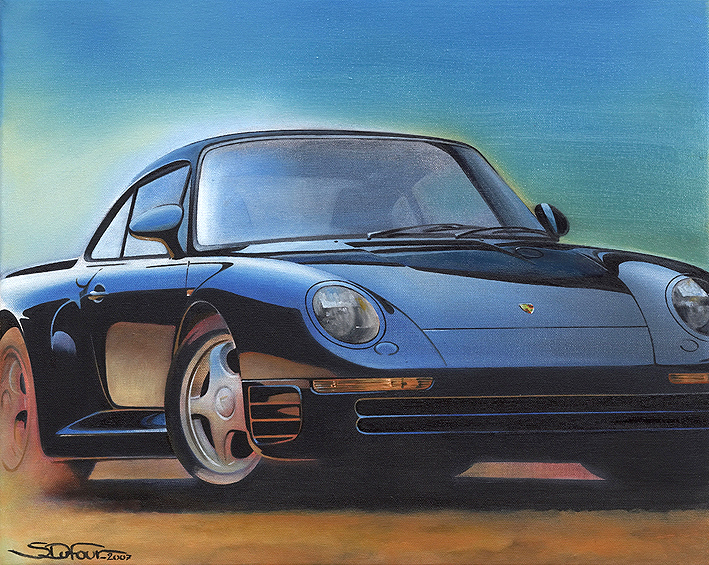 Any authentic car enthusiast will take pleasure in surfing through this web site, Stephane’s personnal art gallery. Every canvas issued, whether it be an original or a limited edition is signed and market by the artist. The paintings are on sale and delivered with great care and short delivery delays.